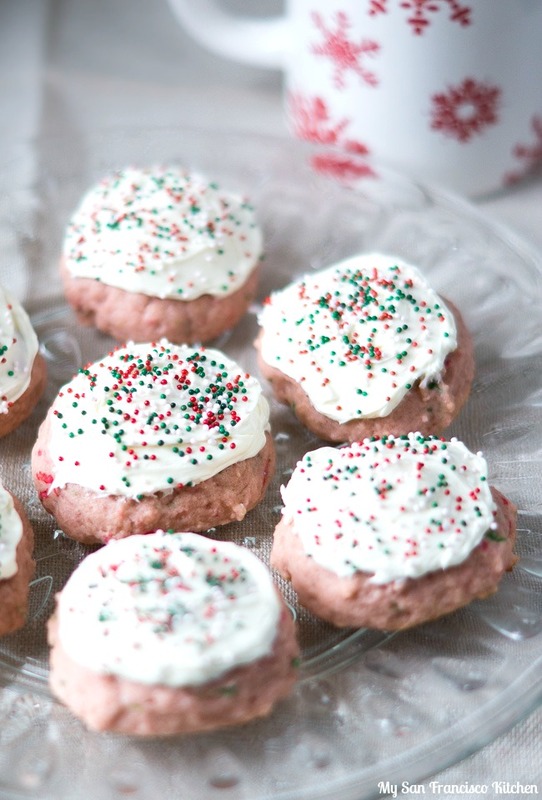 These ricotta cookies are decorated with cream cheese frosting and Christmas sprinkles on top. They are soft and cake-like with a hint of lemon, and perfect for giving away as a gift for the holidays! Tomorrow is Christmas, tomorrow is Christmas! Ricotta cookies are soft and cake-like, and just perfect for a thick layer of frosting on top. Oh, and don’t forget the sprinkles! You can decorate frosted ricotta cookies however you want. 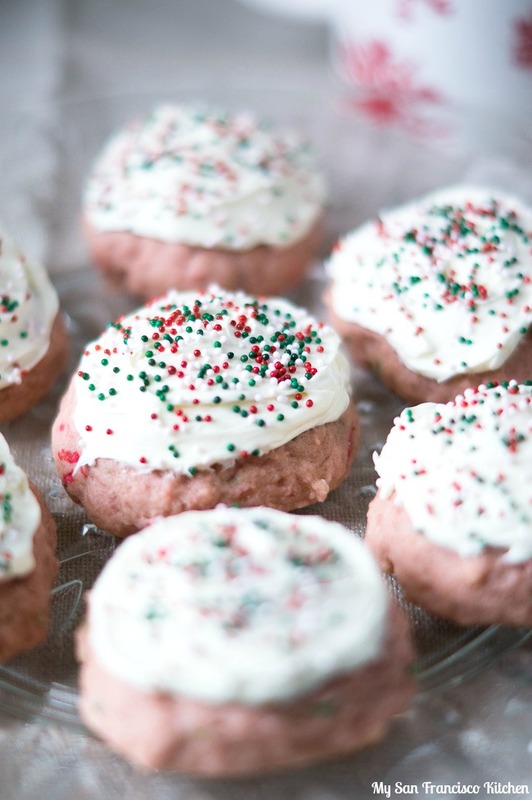 For these ricotta cookies, I used whipped cream cheese frosting and Christmas sprinkles. If you are wondering why these ricotta cookies are pink, it actually was not planned!! 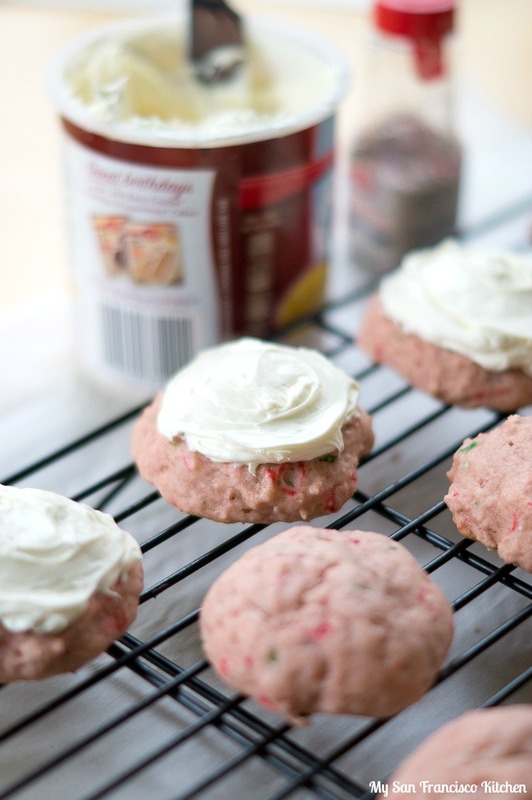 It was one of two holiday baking mess-ups I had this year…you see, I added the Christmas sprinkles into the cookie dough, thinking it would look pretty with red and green sprinkles inside of a white cakey cookie. 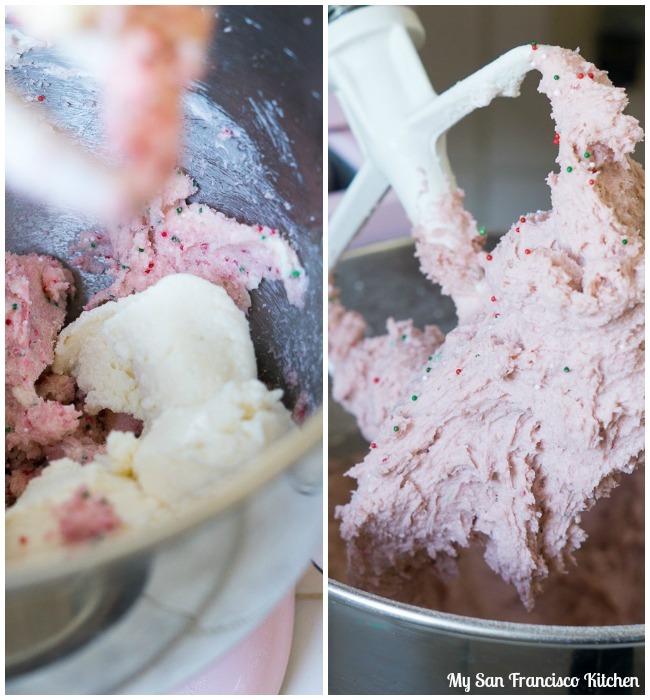 Once I added them and turned on the mixer, the dough immediately turned pink! I guess some of the coloring from the red sprinkles mixed into the dough and colored it pink. Oops. In the end, they still tasted good, and the color didn’t matter so much anymore. Next time I won’t try that little sprinkle trick and keep them a white color, since I think they will look prettier and more Christmas-y. Cream together the butter, sugar and lemon zest in a stand mixer with paddle attachment (or with an electric mixer). Add the ricotta cheese, egg and vanilla extract while mixing on low speed. 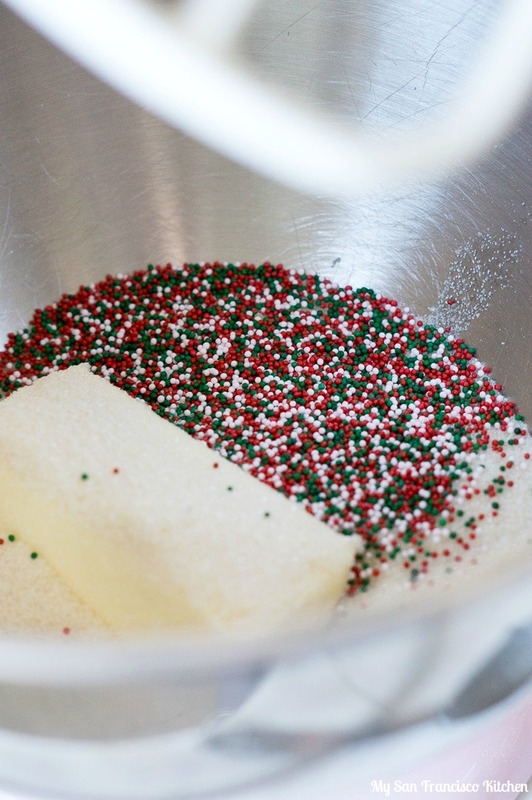 Slowly add the flour, alternating with some sprinkles if desired, until it is completely mixed in. Chill the dough for one hour in the refrigerator, wrapped in a ball in plastic wrap. Form 1-inch balls with your hands and place on a baking sheet lined with parchment paper (or nonstick baking sheet). Bake the cookies for 15 minutes, until firm to the touch and golden on the bottom. Cool the cookies completely before frosting and decorating with sprinkles. This entry was posted in Christmas, Dessert and tagged cheese, christmas, cookies, holidays, ricotta. These are adorable and look really, really good! ooooh I’ve never seen cookies quite like these and they look SOOO good!